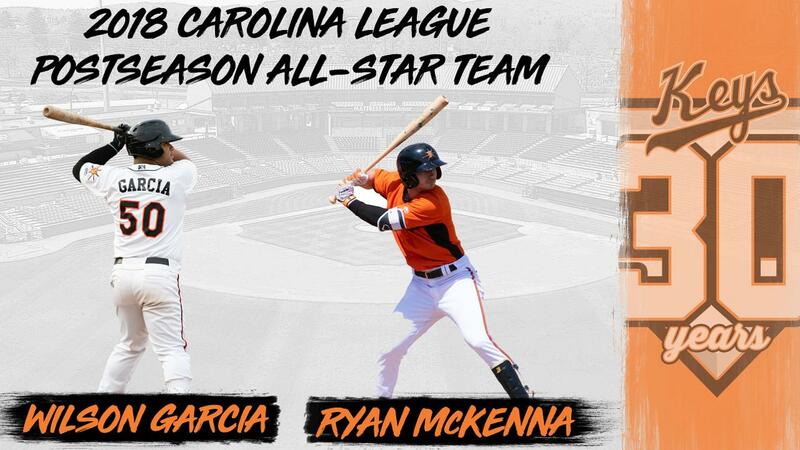 FREDERICK, MD-The Carolina League announced that Frederick Keys infielder, Wilson Garcia and former outfielder, Ryan McKenna were selected to the Carolina League's Post-Season All-Star team. It marks the first time Garcia has been selected to a midseason or postseason all-star roster in his career. McKenna was named to a postseason all-star team for the first time after being named a CL midseason all-star. Garcia, 24, turned in his best professional season, slashing .295/.328/.521 to go with an .849 OPS. Selected as the first baseman on this year's postseason all-star squad, Garcia hit 23 home runs to go with 70 RBIs, 24 doubles, 60 runs scored and 122 hits across 108 games. Leading the league in total bases (215), Garcia also placed second in home runs and slugging percentage (.521) and ranked third in hitting and extra-base hits (47). Perhaps the most impressive thing about these numbers, is that Garcia did not arrive in Frederick until May 1, when he was acquired in a trade with the Phillies. Among O's minor leaguers, the 24-year-old tied for first in home runs (with former Keys first baseman Aderlin Rodriguez ) and finished fourth in RBIs and fifth in batting average. Personally, the Keys infielder established new career-highs in home runs, RBIs, slugging percentage and runs scored. Garcia was originally signed by the Philadelphia as an international free agent on November 20, 2010. One of four outfielders selected to the CL postseason squad, McKenna, 21, took the Carolina League by storm before a promotion to the Double-A Bowie Baysox on June 21. With Frederick, the Keys former centerfielder hit .377/.467/.556 with a 1.023 OPS in 67 games. Finishing with 97 hits, McKenna also added eight home runs, 37 RBIs, two triples, 18 doubles, 60 runs scored, five stolen bases and 143 total bases with the Keys. At the time of his call-up, he led all of Minor League Baseball in hits and on-base percentage while ranking second in batting average, runs scored and tied for fifth in total bases. He finished the season with a .315/.410/.457 slash line and an .868 OPS to go with 11 home runs, 53 RBIs, four triples, 26 doubles and 95 runs scored in 127 games between Frederick and Bowie. Among Orioles minor leaguers he tied for first in hitting (with former Keys teammate J.C. Escarra ). Twice named Carolina League Player of the Week this season, McKenna was originally picked by the Orioles in the fourth round of the 2015 draft out of St. Thomas Aquinas (NH) High School. Salem's Bobby Dalbec was named the Carolina League's Most Valuable Player, Potomac's Will Crowe claimed CL Pitcher of the Year Honors and Winston-Salem manager Omar Vizquel was voted as the circuit's Manager of the Year.